Your call is very important to us and if you get an answering machine it's because we are helping another customer and we do not like to put people on hold. Please leave a message and we will return the call, usually within one hour. When leaving a voice message, please speak clearly and slowly. Also please leave your phone # with extension, if any and the best time to return the call. We promise to not put you on hold either. Dings Away can repair everything from door dings and small dents to minor fender benders-as long as the paint has not been cracked and the metal is not creased or crimped. It’s called Paintless Dent Removal, and no one does it better than us. Dings Away has been exceeding customers' expectations in Palm Beach since 2001 and we have been perfecting the dent removal process since 2001. 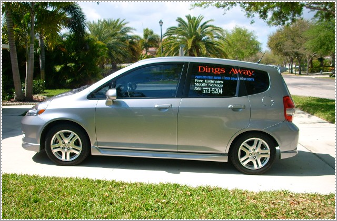 Dings Away is locally owned and operated family business.